Mária Banášová entered Slovakia ́s arts scene in the late 1980s and her rst exhibition in Bratislava already gave its visitors a pleasant surprise. She addressed them with a collection of exceptional ceramic sculptures combining a woman ́s imagination with a humour quite unusual and unforeseen in those days. They were refreshing compositions, torsos as well as complete gures providing a witty look at life, unexpected situations, and yet a common man ́s deepest emotional life, too. In the following decade, she enjoyed the many chances to meet her fans and supporters at her solo exhibitions in Slovakia, but above all abroad, in Germany, Austria, Hungary, Poland, Bulgaria and Romania. Most of her pieces of art left the studio and galleries and found their enthusiastic owners. Still, she withdrew herself as an artist unexpectedly and for a longer period of time. This time of silence, however, has not been wasted. On the contrary, during the recent three to four years the shelves of her studio – the former renowned tea-place in a family house in Bratislava ́s street Líščie údolie – have accumulated her latest works which amaze with their integrity and composedness, the updated original techniques and above all with their naturalness and spontaneity. Her arts has matured, her ceramics have gained a more personal cabinet size and solid format, and the famous “Banáš”-humour has taken on new dimensions. 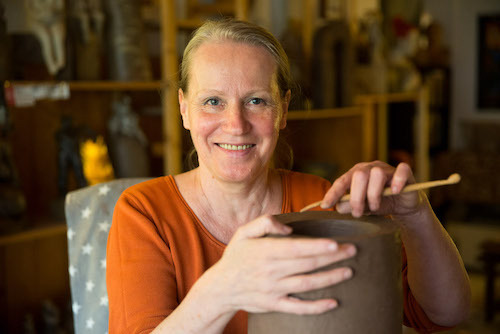 As in her earlier days, Mária Banášová works with clay exclusively. She sculpts, decorates with glaze plainly and moderately and after the rst ring, she often puts the nishing touches with ne painting or gilding. As a result we see stoneware – robust and earthy, reminding us of the beginnings of ancient civilizations, of the Mediterranean cultures as well as of the works of great European contemporary artists. time. And this may be the reason why Banášová often turns to ancient times, to eternal truths of great philosophers and to mythological messages and symbols which she then, using new situations, gestures and mimicry, places within a contemporary context. Many of her “heroes” have been mounted on pedestals, some have simply used the backs of others to crawl up, and even what seems to be pure gold on a crown or a laurel wreath may be just a facade hiding the dark side of an un attering face. The kind, though slightly ironical and above all forthright humour of Mária Banášová makes us smile. We nd it in postures and gestures as well as in tting titles some of which she loves returning to thus recreating different variants of the same story. One of her initial sources of inspiration which we encounter all through her artworks besides the often varied story of a “man around one ́s neck” is the gure of a clown – elegant, ligree, charming, sad or nostalgic, clumsy or even helpless. Sometimes, the clown hat symbolizes carefreeness, other times it represents hypocrisy or despair and it does not matter if the hat sits on the head of a man or a woman. Inscriptions have become a distinct element giving her latest works not only calligraphic value but also a deeper meaning. We nd quotations on pedestals and socles, on gates and arches, serving as messengers and guides through human history. An essential part of Banášová ́s ceramic work comprises utilitarian-decorative objects, mainly bowls, vases, bottles displaying unconventional robust forms and modest colours enlivened by plastic fragments of gures or accurately painted plant motifs. They are the nishing lines of stories about clay and its artistic transformation into volumes and shapes that are able to bring a joyous playfulness as well as sincerity and humanness – all becoming much too scarce nowadays – into the world of modern man.